Living in a small apartment can bring up plenty of little problems around your living space. You can run into different types of problems like – a bed that takes up too much space, too much furniture, or not enough color. That’s why we at the Oliver decided to share a list of the best space-saving tips for apartment living. We know that you might not own the biggest space, but you deserve to be able to live comfortably, especially while you’re in college. The following are some awesome space-saving tips that will help you get rid of those pesky little problems around your apartment. Not all apartments are the same, so you shouldn’t treat every apartment the same. Some are meant for a single person, while others are meant to be shared by a larger group of people. Whatever your case may be, you should always consider how much space you truly have. Remembering whether you’re going to be sharing your living space with someone else or having all for yourself and help make a world of a difference. Of course, living by yourself doesn’t mean that you will have a bit more space. If that’s the case, you can go ahead and move in whatever you’d like to the apartment, as long as it’s not too much. Once you recognize and make sure of how much space you have to play around with, we can start moving into the fun stuff. Unless you’re going to be sharing a bed, there is no need for you to go queen or king size. In most cases, beds tend to take up most of the space in your bedroom. This why we suggest that you give yourself a bit more leeway and old back on bed size if you can afford to. 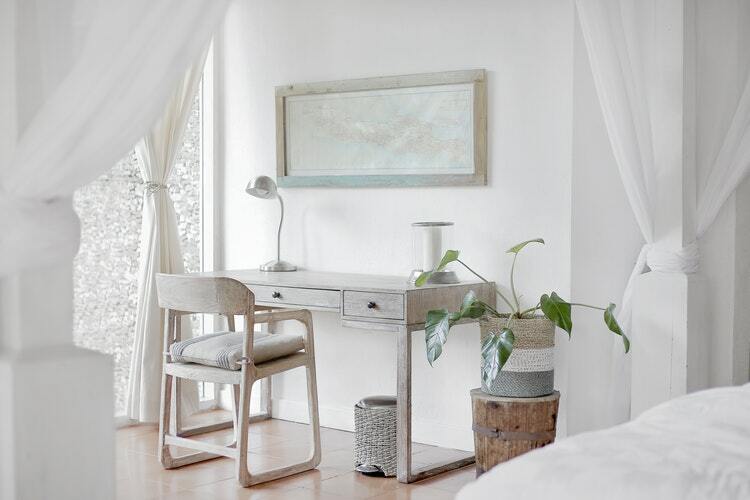 This way you can make room for your desk for a nightstand in case your bedroom is kind of small. You can also try placing your bed on a corner to help you create a larger area between your closet in your bed. You still have the same space if you leave your bed in the middle of the room, but it’ll be divided on both sides of your bed, making it tougher to move and decorate. Compared to traditional office desks, a small desk is perfect for saving space, especially when you only need your laptop, a notepad, and some writing utensils. You can even leave your laptop open and play some music in case you ever decide to work out in your bedroom. Mini speakers are crucial when you’re living in an apartment. You can buy yourself one that hooks up to your phone through Bluetooth technology and saves you a lot of space on a stereo system. It gives you the ability to be able to take your music anywhere in your living space, whether you’re in your shower, or cleaning the kitchen. Another great way to save some space throughout your apartment is by substituting storage furniture with wall shelves. This will allow you to put up any book, movies, CDs, or anything else that’s small in size but takes up storage space. It’s a great way to keep your apartment looking modern and save room at the same time. Just remember, you don’t have to buy premade wall shelves. You can always make them yourself by looking up wall shelf ideas on Pinterest. It’s the perfect way to get inspired and give your home your own twist on your terms. They’re simple to make and you’ll learn how to save some bucks in style. This method also works for making room in small restroom spaces. Believe it or not, foldable laundry baskets can help you save some space. In comparison to traditional laundry baskets, foldable laundry baskets can usually carry more clothes and take up much less space when they’re empty. This can help you free up some space in your bedroom and your laundry room during and a bit after washing day. Have you tried hanging your pictures on the wall instead of leaving them on counters or tables? Setting pictures on the wall can help you free up space and give your apartment walls some more appeal. It’ll also help prevent visitors from moving your precious valuables when they come over for a visit. They don’t mean harm, but we know how much of a hassle it can be to reorganize a countertop. You can transform your windowsill into a cozy little hangout spot or study area if you have one. In case your window sill is large enough, all you have to do is get a blanket, some pillows, and a spongy mat to create a small hangout spot. There are some window sills that cover less room, but no worries, you can still use it as a shelf, a desk during warmer seasons, or as a spot to leave some flowers. How about building a small shelf you can mount by your bed instead of a traditional nightstand? You can take a crate and tilt it on its side to use it as a storage spot for your pocket accessories (phone, keys, wallet, etc.). It leaves you with a bit more room underneath the shelf, allowing you to put your slippers or sandals there. Some closets aren’t as roomy as they should be, but we tend to overlook the possibility of fitting a few more things in there. We often get stuck into thinking that closets are solely for hanging stuff up and forget about the extra room on the ground and above. The ground floor can usually hold about one or two clothing bins where you can store your socks, underwear, and other extra clothes. The top space can also hold some extra clothes or any storage boxes you have lying around. You can even install an extra hanging rod in your closet to automatically double your storage space! On the other hand, you may have already maxed out on closet space. Wardrobes can help add a bit more storage room for you to do away with your mess. You can always sand your wardrobe and give it a nice color to match with your other furniture. You can also use medium height wardrobes/dressers to use as a television stand in your room. Just make sure you place it on the right spot and you’ll take care of two birds with one stone. You can build yourself a reliable Murphy Desk or come up with your own bendable invention to help save you some space. This is one of the best proactive alternatives that can help you save space and build a useful piece of furniture. One of the best multi-purpose inventions to save space is the drop leaf table. You can use it as a shelf on the wall and simply pop the extension into place once you’re ready to fully use it. Do you have an empty closet or room around the house? You can take advantage of any unused space, like a closet, to use as living space. You can add a television or personal desk in the empty space, giving you more free room around your apartment. Another neat way to make room in a living room is doing away with a coffee table and adding an armrest instead. All you have to do is build or buy one that fits on the side of your sofa, and let the magic take place.